Facing a hip replacement can be a daunting prospect. It’s widely recognized that this procedure can help eliminate hip pain and discomfort in the long-run, but the long recovery time associated with such a major surgery can be intimidating. And sometimes a fall can result in a hip fracture or extreme trauma to that region, requiring immediate surgery. Whether required or elective, here are some tips for preparing and recovering from hip replacement surgery. Before signing off on surgery, make sure that you have explored all other options with your medical team. 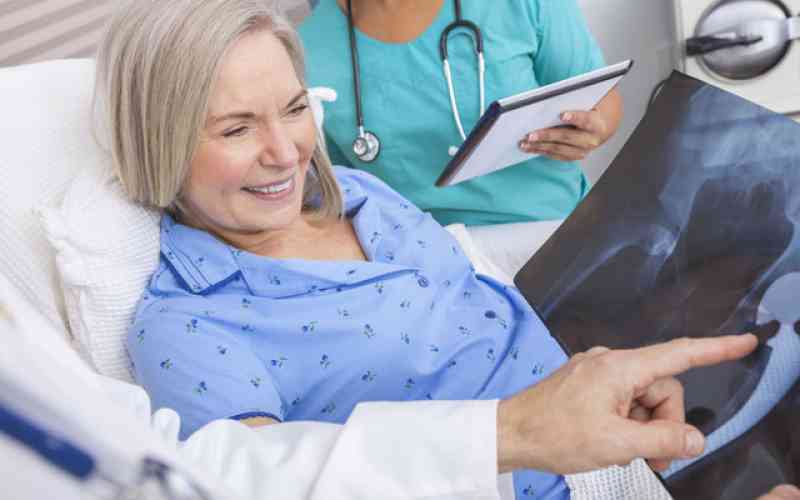 If you are suffering from hip pain rather than a fractured hip, there may be less invasive solutions available for you, such as physical therapy. In some cases, a hip replacement may be your only option. Once you have committed to having surgery, make a list of all of your pre and post-surgery questions. Keep the doctor’s office number on speed dial, and don’t be shy about calling to ask questions. Being well informed is an important step toward improving recovery time. It helps to do some research on your surgeon. Does he or she have a good reputation? Check to see if you can find reviews online and ask lots of questions. What is his or her philosophy about patient care? Will your surgeon communicate with you directly about expected recovery based on your personal health status? It often helps to get a second opinion too, if for no other reason than to confirm the recommendation of a hip replacement. Most importantly, once you agree to have hip replacement surgery, it is important to follow the doctor’s instructions to a tee. Eating poorly can make you feel worse both leading up to and after a major surgery. With any surgery that involves anesthesia, patients often suffer from digestive issues. Your doctor will have specific dietary restrictions in order to minimize these effects, but try to eat light foods like lean proteins, fruits, and veggie and avoid fatty, starchy foods as these can exacerbate digestive issues. In addition, the extra nutrients from a healthy diet can help your body recover faster. Following a hip replacement surgery, expect to spend 2-4 days at the hospital barring any complications like infection. You are unlikely to be discharged from the hospital until you can get in and out of your bed unassisted, go the bathroom on your own, and are able to manage the pain. Typically, hip replacements are discharged to home. Plan for how you’re going to manage the activities of daily living after you are discharged. How will you bathe, shop, cook, get to follow-up medical and therapy appointments? You can expect to require help from three to six weeks following surgery and usually are prohibited from driving for 3-6 weeks or longer. Give some careful thought as to how you will organize the help you will need to prepare meals, climb stairs, or keep up with household chores like laundry after a major surgery. You may have family and friends who can help. Be specific about when and how they can provide support. You don’t want to be stuck without help if a friend has an unexpected emergency. An alternative is a Restorative Stay at Kyffin Grove where they’ve developed a recovery program that features cruise ship style service and amenities for people recovering from major operations. Guests are provided with fully prepared delicious and nutritious meals, on-site physical therapy, transportation to and from doctor’s appointments and much more. To find out more, schedule a visit. Recovering from a hip replacement can be a long and difficult road, but it’s important to follow rehabilitation guidelines exactly and to give yourself time. Being patient and kind with yourself can help speed your recovery. Conversely, trying to do too much too soon may be detrimental to your healing. Your doctor may share guidelines about typical recovery times, but remember that everyone is different, so just be patient and pace yourself.